Smart Retail: Gimmick or Reality? Smart retail has slowly shifted itself away from being a mere gimmick to becoming somewhat of a reality. When was the last time you walked into a physical retail store, saw something you liked, and bought it right off the racks? 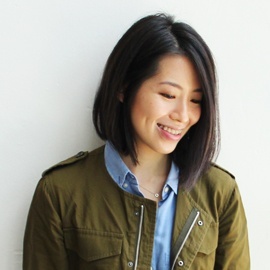 Like it or not, here’s what the savvy shoppers of today would do – whip out their smartphones for further research, search for said item on online platforms such as Carousell or Taobao, and hunt for ongoing deals and coupon codes. The best thing? Finding out that there’s also free shipping provided right to their doorstep. The physical retail slump is real – never would we have imagined seeing headlines talking about the decline of our world-renowned shopping strip at Orchard Road. Singapore, as a small country, has matured to become big on internet, with a whopping 82% mobile penetration (the highest in the world, in fact! ), and these numbers show for themselves. Retail stores are now at a crossroads – some choosing to focus on key locations with proven footfall, while others are investing large amounts in going digital. But which will prevail in the long-term? In our opinion, even the best-researched location with high footfall will not be sufficient or sustainable in the long run. It’s crucial to understand key trends, changing consumer behaviours and new technologies – all to future-proof your stores. While statistics support the use of e-commerce, simply having an online cart check-out or fully-digital EPS system is no longer enough to cater to the ever-changing behaviour of shoppers. Smart technologies, digital advertisements and the creation of unique customer experiences are already rampant in more developed markets such as in the USA and China, and many expect these to make huge impacts in our local market over the next few years. Some local retailers have been quick to the trend, embarking on implementing digital their entire operations. Home-grown tech retailer Challenger is one great example, as they announced this April their $500,000 investment to refurbish all 4,000 square feet of its flagship store for new retail concepts. 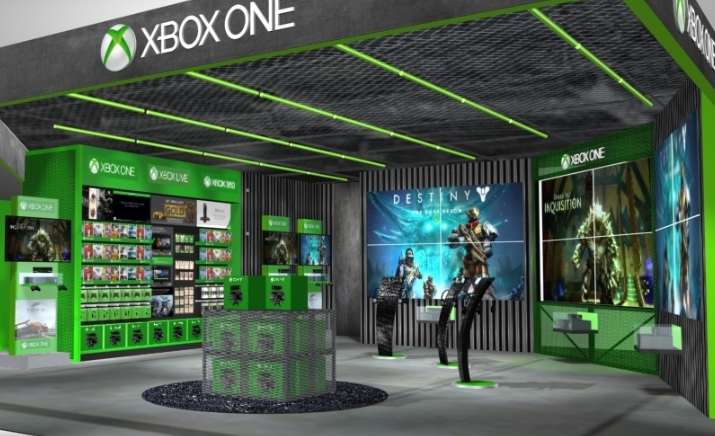 The one thing that caught our eye from the reports was the proposed development of an XBox Xperience Zone, boasting three 110-inch video walls for shoppers to immerse themselves into the games. The danger here, however, is delving into technology for the mere sake of it. The risk of being seen as gimmicky is ever-present – including unnecessary ‘smart tech’ like these smart mannequins. While it is really tempting to be at the forefront of every single development, the use of customer-facing technology should only be for one reason alone – to meet shopper’s needs through the offering of a seamless shopping experience. Other functions such as improving efficiency, altering capital-to-labour ratio, increasing margins and lowering overhead costs should be a secondary purpose of going digital. You’re walking around the mall, and you come across this large advertisement for the Nike Flyknit Racers. It gets you excited, and you head on over to the store to try them on for yourself. The retail staff attending to you has them on too, and it entices you even further. You try on multiple pairs, getting yourself comfortable with the different sizes and colours. After deciding on a black pair of US10-sized Flyknits, you do a quick two-second search on Google – and realise that Zalora has them too, with an additional 20% off since you haven’t made your first purchase. You walk out the store, empty-handed but delighted at the deal you just got – while Nike gets rejected, making further losses on their rental, staff hires, electricity bills, and more. Retail spaces of today no longer serve as good point-of-sales, since online retailers will always have the advantage of enticing customers with lower prices (by simply having lesser overheads). That being said, does it mean online giants entering the physical retail realms have all lost their collective minds? Well, although Amazon, Warby Parker, Birchbox, and closer to home, Zalora, have been launching physical stores and pop-ups all over, they’re simply re-inventing the definitions for retail spaces. These stores serve as hubs – to market their brand, forge closer customer relations, in turn boosting their online traffic. Zalora’s pop-up stores do not even allow customers to do actual physical check-outs, instead providing iPads to process their orders. Andy Dunn, founder and Chief Executive Officer of Bonobos, also operates over 20 physical stores termed as ‘Guideshops’ – there, customers can get fitted, and have their orders placed and arranged for delivery. 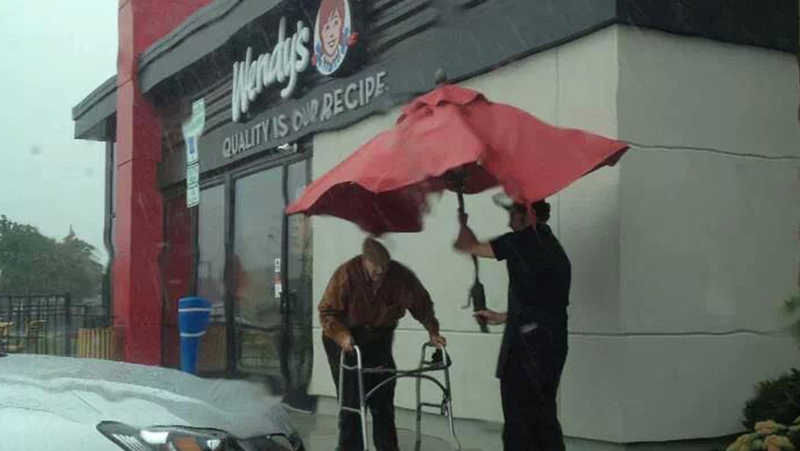 Wendy's employee removes umbrella from outdoor table to walk elderly gentleman to his car in the rain. While computer-mediated technologies and social media have revolutionised the way us humans interact with one another, they will never ever replace the nuances of voice, tone, body language, and all human-to-human communication. In the same way, physical spaces offer the opportunities for your customer to experience your brand and products with all of their five senses, something the digital realm isn’t able to offer (well, not yet). As such, the physical environment is able to create a sense of community, setting the foundation for important customer retention metrics of trust and loyalty. It’s not all doom and gloom for offline retail. Many of the more memorable experiences and lasting relationships have been made and built in person – such as the Wendy’s employee who went out of his way to help an elderly customer to his car, as well as the thousands of other such incidents on the “faith in humanity restored” subreddit. Making sure your business is one with a human-centered, service-oriented culture matters a lot today – and often emerges as the undisputed advantage a physical retail store has over an online one. The retail industry may be shaken and reeling from countless high-profile closures, declining revenues and decreasing footfall, but the future of the industry is not a simple matchup between staying physical or going digital. We say it’s about marrying the physical space with the digital realm, and catering to the increasingly complex needs and wants of the modern-day, internet-obsessed consumer. The way goods are stored and sold will undoubtedly change over the years, and coupled with newer, always-on digital technology, and there’s absolutely no way anyone can predict how the retail scene will shape up.